The N-N triple bond in molecular nitrogen is one of the strongest and most stable chemical bonds in nature, giving rise to the two most commonly observed states, the solid and liquid. Molecular nitrogen itself, however, has shown a surprising degree of polymorphism, leading to a complex phase diagram that is still incomplete in the high pressure and temperature regions. Particularly important is the region near the melting line at pressures higher than 50 GPa, where theoretical work and shock wave experiments have suggested the transition to a polymeric form, which occurs at much higher pressures at low temperatures, according to previous static compression experiments. Recent work by Alexander Goncharov and colleagues at Carnegie and Lawrence Livermore National Laboratory have obtained Raman spectra up to 120 GPa and 2500 K for both solid and fluid nitrogen in an effort to clarify the behavior of this system at high pressures and temperatures. To probe the material directly at high P and T, a pulsed laser to the sample was combined with a second pulsed laser that excited the vibrational spectrum characteristic of the molecular state of the solid. 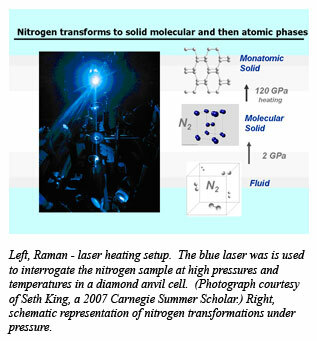 This pulsed Raman spectroscopy technique allows the acquisition of spectra at precisely the peak temperature of the sample, and also reduces the background thermal radiation from a metallic laser light absorber. The spectroscopic data show that nitrogen in the fluid state remains in the molecular form throughout the pressure and temperature ranges investigated, and that there is no evidence to support a fluid-fluid transition. As shown in the figure, the melting line reaches a maximum in temperature with increasing pressure at around 70GPa, followed by a decrease up to a triple point at approximately 87 GPa. This behavior suggests an explanation for the onset of amorphization at still higher pressures and lower temperatures as has been observed previously in SiO2 and H2O [Goncharov, et al., Phys. Rev. Lett., 101, 095502 (2008)].